What impact can be possible out of PMâ€™s Central Asia Visit? What impact can be possible out of PM’s Central Asia Visit? From July 6-13, 2015 Indian Prime Minister Narendra Modi visited five Central Asian countries of Kazakhstan, Kyrgyzstan, Turkmenistan, Tajikistan and Uzbekistan, a resource rich region which is primarily influenced by Russia and China.While India is aspiring to become a new factory of the world through ‘Make in India’ drive, better ties with Central Asia will help in making this dream a reality as this region boasts of huge reserves of oil, natural gases and uranium. 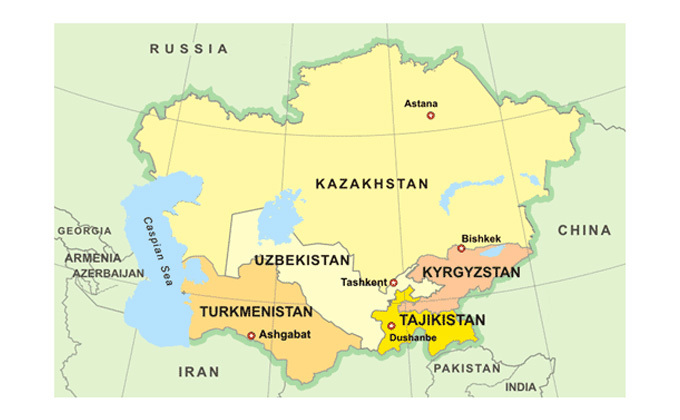 While Kazakhstan is a major oil producer in the region, Turkmenistan and Uzbekistan have one of the biggest natural gas reserves, and Tajikistan and Kyrgyztan are believed to have considerable untapped reserves. The main focus of the eight day tour was to boost economic ties and enhance cooperation in defence and cultural sectors. Central Asian countries on their part are also looking to diversify their exports as China remains the primary buyer of their energy exports. Implementation of contract for supplying of Uranium. India would now import 2000 tonnes of uranium from Uzbekistan. Cooperation in Agriculture, IT and energy. Exploring the options to enhance surface connectivity between Uzbekistan and India. As of now, two countries are connected either through sea route via Iran or through air route. To promote tourism as an important way to enhance the bilateral ties. India appreciated Uzbekistan’s support in getting membership of Shanghai Cooperation Organization (SCO) as well as its support for India’s permanent membership in United Nations Security Council. The national railway company of Kazakhstan to invest in infrastructure sector of India starting from Mundra port in Gujarat. Kazakhstan would be supplying 5000 tonnes of uranium to India during the five year period from 2015-19. Kazakhstan also expressed it desire to build solar plants of up to 3 Giga Watts in India. India would help the central bank in Kazakhstan in implementing financial inclusion. India also called for cooperation in defence in the fields of joint training and technical cooperation. A joint statement termed the TAPI (Turkmenistan-Afghanistan-Pakistan-India) gas pipeline project a "key pillar" of economic engagement between India and Turkmenistan. Both countries show their resolved to fight terrorism, organized crime and illicit drug trafficking. Agreement signed in the field of cooperation in sports. Cooperation in field of Science and Technology. Cooperation in the field of Yoga and Traditional Medicine. India and Tajikistan agreed to cooperate in the field of culture through exchange of expertise in protection, preservation and promotion of cultural heritage. Exchange of Note Verbale (NV) on setting up of Computer Labs in 37 Schools in Tajikistan. India and Kyrgyzstan signed MoU on cooperation between Election Commission of India and its counterpart. Agreement signed in the field of cooperation in standards which would help in enhancing economic ties. Both countries agreed to deepen bilateral cooperation in the fields of defence, security, military education and training. From now onwards, joint exercises between India and Kyrgyzstan would be an annual affair. Both sides agreed to expeditiously consider signing an agreement on "combating international terrorism and other crimes". Both sides agreed to work together for early conclusion of a Free Trade Agreement between the member states of Eurasia Economic Union and India. The economic ties between India and Central Asia, though deepening, but still are way below their existing potential. PM’s tour to Central Asia no doubt has pitched for increasing bilateral economic ties; however, the enhanced cooperation in defence and energy sectors underlined the fact that increasing dependence on each other would open the prospects of strategic relations in future. While Central Asian countries are looking for diversifying their energy exports, India is also looking to tap the energy from various sourced to reduce dependence of energy imports on few nations. In this way, India is ensuring energy security to propel its sustainable economic growth. However, apart from energy, cultural and other trade ties, this visit must also be viewed in the backdrop of PM’s erstwhile visits to Mongolia, South Korea and Japan. With enhancing ties with the Central Asian countries along with eastern and northern neighbours of China, India is probably counteracting China’s strategy of encircling India via investments in Myanmar, Bangladesh, Sri Lanka and Pakistan. As India has now got the full membership of SCO (The Shanghai Cooperation Organisation) along with Pakistan, it is also become necessary for India to deepen ties with Central Asia or else, Pakistan may use SCO too as a platform for its propaganda against India. And last but not the least, in the new order multipolar world where India is aspiring for a greater role in the global geopolitics, it is important for India to make its presence felt in every region of the world.